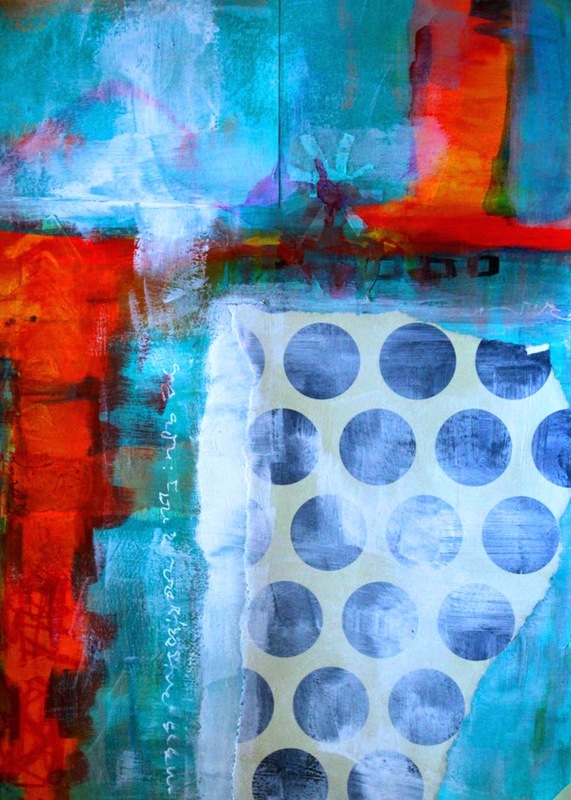 Part of creating abstraction is playing with some of the basic elements of art, lines, shapes, colors, and balance. Today's abstract work was an exercise that dealt with all of these elements. It began as a collage that combined some handmade and found papers. Dark lines and dots were the first inspiration. I added some complimentary colors, red and green, but was not pleased. A dash of purple didn't help. As layers began to build, the work wasn't coming together for me. I added some stenciling, then some paint markers, then some more paint. I let it sit for several days. The balance was off. I had lines dissecting the paper in ways that didn't work. I added some black paint. It was too dark. Still I was not happy. It sat for a few more days and I worked on other compositions. Finally in a fury I painted the three white circles. Suddenly it seemed to work. A balance of light and dark, rectangular and circular forms, and textures came together in a cohesive abstraction that I call Leaving the Dark. The title is both figurative and literal. Literally I moved from black to white and figuratively I felt an accomplishment the took me from a cranky, dark place to a light hearted mood. It was all about the balance. I am happy. 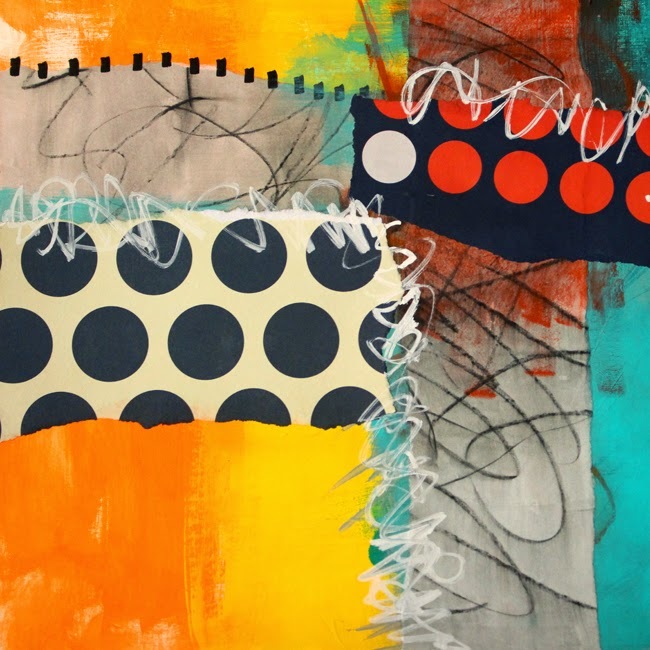 Reproductions of this abstract collage painting are available from my website. Details are here. You might also like some of my other abstract work. Check out my abstract gallery here. 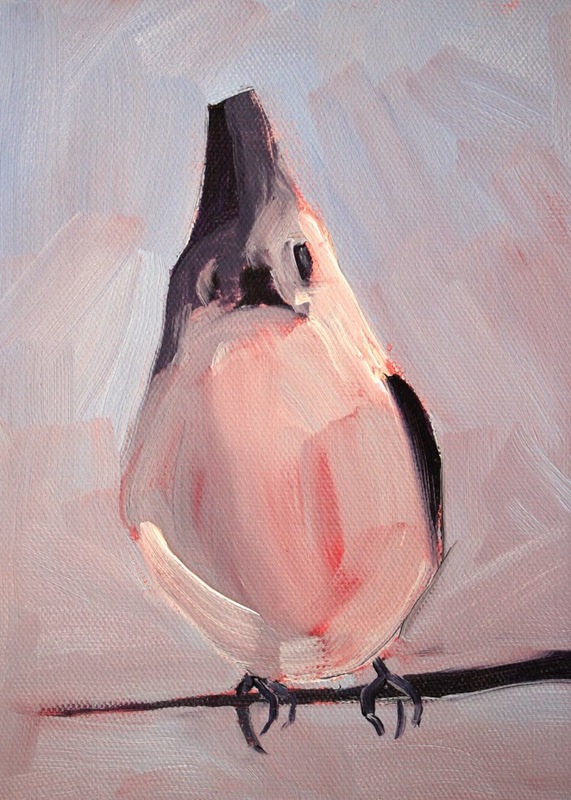 Painting little creatures with a limited palette and few brush strokes was part of the inspiration for this little bird, the first painting of the day. Ultramarine Blue, Alizarin Crimson, and Titanium White were the three colors I used in its creation. He was painted on a 6x8 inch stretched canvas with oil paints. A wash of crimson started the process. The original painting is for sale in my Etsy Shop in the Birds and Animals section. Details about this little guy are here. Reproduction prints are also available on paper, canvas, acrylic, and metal at my website in the Birds Gallery. Also, just for fun, he is also available on note cards, phone cases, and throw pillows in a variety of sizes. I hope you will visit. This little 6x8 inch painting has gone home, sold to a buyer from Bend, Oregon, one of my favorite towns on earth. It was inspired by the high desert and Cascade Mountains that are so visible from the plains of Central Oregon, so I am pleased that it can make its home in the landscape that inspired it. The original painting was created with professional grade oil paints. Reproduction fine art prints and posters are still available from my website in the landscape gallery. I hope you will stop by and see some of my other landscape paintings, too. 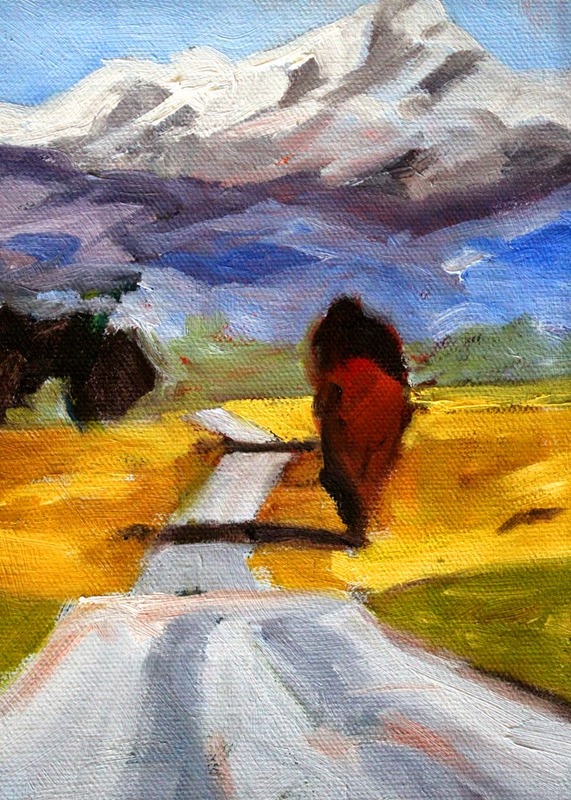 Recently I have moved back to painting roads. The demands are diverse and give me an opportunity to work on a number of skills, all about perspective. The ability to paint proper aerial perspective is the first requirement that comes to mind. As subjects move into the distance, the colors required to paint a realistic depiction changes as blue moves into the paint and yellow moves out. Secondly, I have to focus on the geometry of the road and how it decreases in shape and size as it moves into the distance. If I don't get it right, it doesn't look like a road. Moving away from objects in the painting is also a consideration. I have to ask myself a series of questions. Do they overlap? What is the relationship in size and how do I depict that? And lastly, I have to consider edges. The closer objects have sharper edges than the objects in the distance. 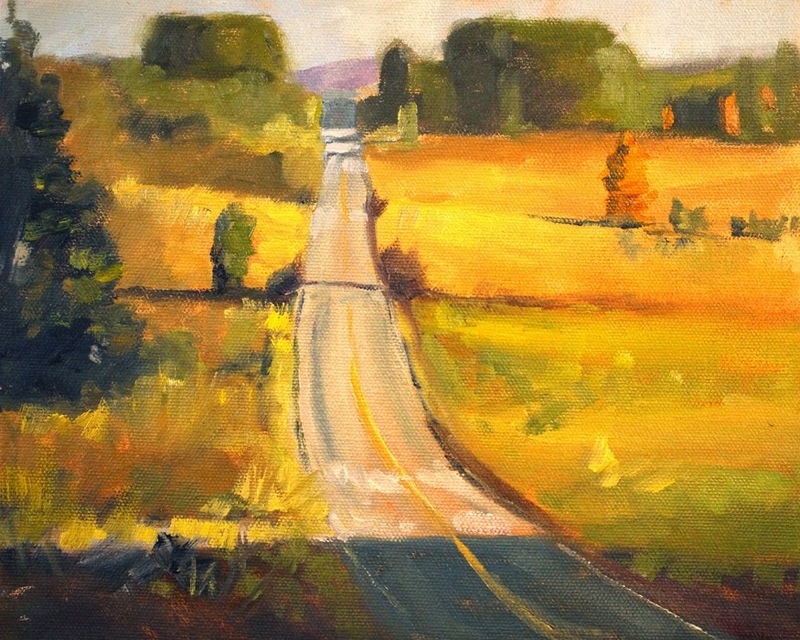 So, you can see why I like to paint road scenes. So many challenges keep me thinking and on my toes. The original painting displayed above was created with professional grade oil paints on a stretched 8x10 inch canvas. It is available in my Etsy Shop of small format original paintings in the landscape section. Prints and reproductions are available in a variety of sizes and surfaces from my website in the landscape gallery. I have several additional road paintings I've been working on, but the paint isn't dry yet. I'll let you see them when they are finished if you check back again soon. This week I was inspired to move back to some traditional work. 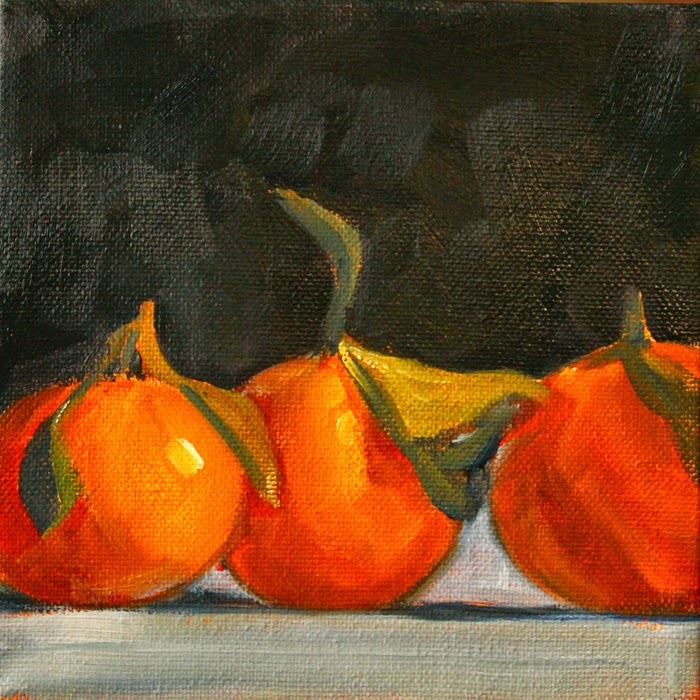 Using a dark background to contrast with the bright orange of a tangerine trio, I worked in oils on canvas. The painting is a small 6x6 inch square format that was an absolute delight to paint, but so difficult to photograph. My son, who is a cinematographer, gave me some great suggestions and I want to publicly thank him for his help. My photographs don't compare to the wonderful work he does with a camera, but I do appreciate his tutoring. The original is for sale here. Reproduction fine art prints are available from my website. My new years resolution was to update my blog twice a week rather than the once a week I have been plodding along with for the past couple of years. That would mean that later this week I would be doing the updating rather than today, but I received some good news that couldn't wait, so I am updating a few days early. This morning I received a notification that this piece in my Spotted Fever Series had been selected for placement on the front page of Crated, a site where visitors can "buy, sell, and discover amazing art." It was very exciting news. If you scroll down, it is in the third row of images. I'm not sure how long it will be there, maybe just today, so I had to share. If you missed it on the front page, it is a part of my collage gallery and can be viewed here. I still have one more composition from this series on my work table and am not sure what surprises it will bring when it is completed. It will join this one and the rest of my Crated art when it is finished. Today I am including another of the Spotted Fever series in my post. I have used almost all of that luscious dotted paper in this series. This design is one of my favorites because of the warmth of the color. It reminds me of a sunset. The horizontal lines remind me of a landscape and how the land and sky seem to spread out in strips of color and design as they recede into the distance. The square format would look great on a stretched canvas with the sides painted black. Although it was created on a sheet of paper, it can be ordered as a reproduction on canvas from my website. 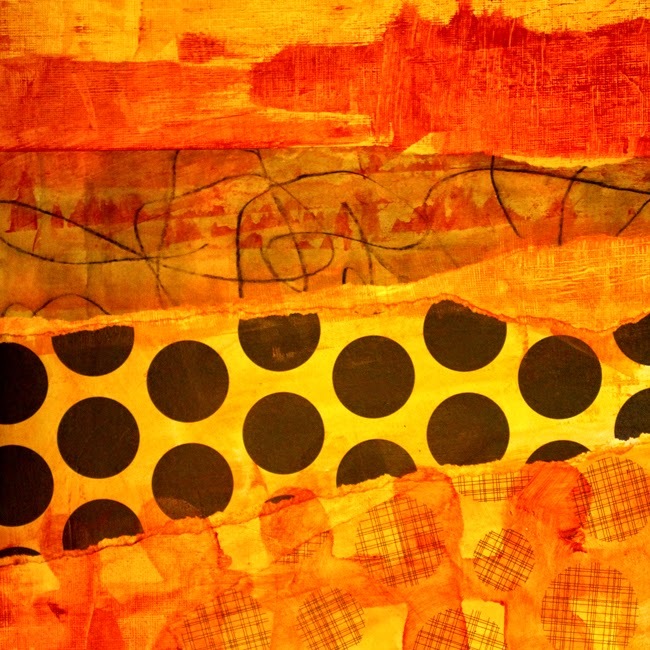 You can view the entire series of Spotted Fever collages at my website or by clicking on the prints tab at the top of the page and selecting the abstract gallery. Back home with my paper, paint, and ink, inspiration arose from a sheet of paper I found on a clearance rack at the local craft shop. 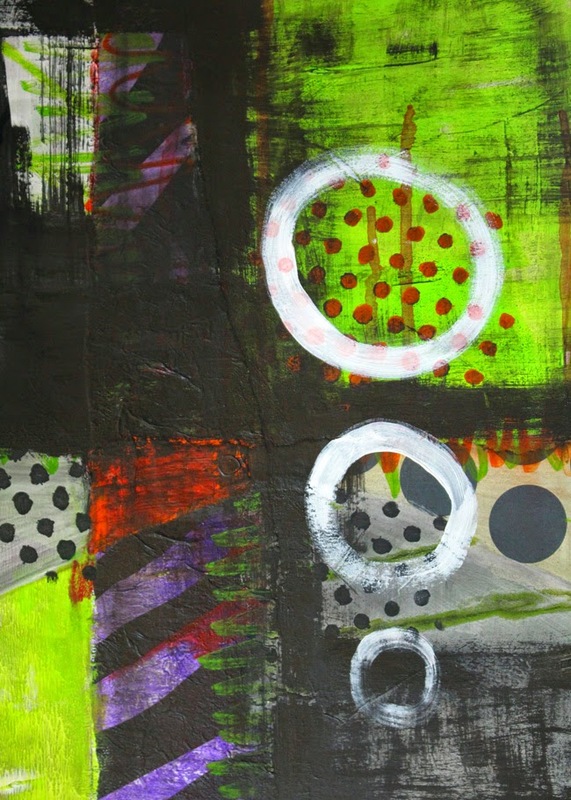 The bold polka dots spoke to me and encouraged a series of abstract collages with the spots as a focus. Torn paper, acrylic paints, pigment ink, and jazz radio in the background helped the design come to life. I have completed a second in this series and a third is still on my work table. When the lovely spotted paper is all gone, I will have to look elsewhere for inspiration or go on a hunt for more spots. You can view the first two in the series in the abstract gallery of my website. The third will appear as soon as it feels finished. Fine art prints and posters are available for purchase. Click on this link or choose the prints or abstract tabs at the top of the page. To see the entire collection of my abstract work, visit here.